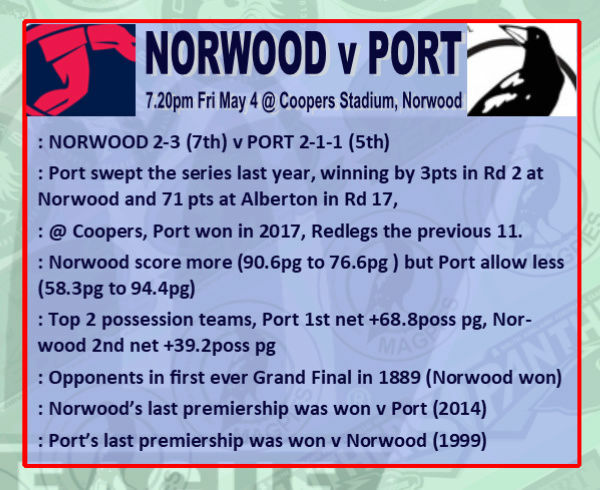 Norwood were shocking in their win over Adelaide while Port lost to Sturt in their last match. Who will come away with the win this week? Power too strong in the big rivalry match. They will have too many AFL listed players and be too quick and big for the legs. If as you say the game was a joy to watch then that is two games in two rounds because even the Eagles supporters in general thought that the North vs Eagles game was of a very high standard. Perhaps the standard of SANFL footy hasn't slipped as much as many of us have feared.